Bacteria from the genus Aeromonas belong to the Aeromonadaceae family. They are Gram-negative facultatively anaerobic rods, oxidase and catalase positive (Parker and Shaw, 2011). Janda and Abbott (2010) classify aeromonads in-to two large groups. The one includes psychro-philic, immotile species as A. salmonicida, and the other – motile mesophils as A. hydrophila. Aeromonads naturally inhabit aquatic environ-ments and cause disease in cold-blooded, warm-blooded animals and humans (Igbinosa et al., 2012). A. hydrophila-caused fish diseases include dermal ulceration, haemorrhagic septicaemia, red sore disease, red rot disease, and scale protrusion disease (Cipriano er al., 1984). A. hydrophila causes substantial economic losses due to high mortality and poor quality of produce (Ibrahem et al., 2008). According to Aoki (1999) most cul-tured and wild freshwater fish species as brown trout (Salmo trutta), rainbow trout (Oncorhyn-chus mykiss), chinook salmon (Oncorhynchus tshawytscha), ayu (Plecoglossus altivelis), carp (Cyprinus carpio), channel catfish (Ictalurus punctatus), clariid catfish (Clarias batrachus), Japanese eel (Anguilla japonica), American eel (Anguilla rostrata), gizzard shad (Dorosoma cepedianum), goldfish (Carassius auratus), gold-en shiner (Notemigonus crysoleucas), snakehead fish (Ophicephalus striatus) and tilapia (Tilapia nilotica) are sensitive to this pathogen. The ade-quate hygiene, periodic drying and disinfection of pools are important for prevention of A. hydroph-ila-induced fish diseases. Disinfectants are products destroying or inhib-iting microbial growth, used for treatment of sur-faces or objects (McDonnell and Russell, 1999). Aeromonads are sensitive to sodium hypo- chlorite, quaternary ammonium salts, iodoform, 2-chlorophenol and glutaraldehyde (ICMSF, 1996). Alcohols are effective antimicrobial agents. They exhibit a rapid broad-spectrum an-timicrobial activity against vegetative forms of bacteria, viruses and fungi but do not possess sporocidic effect (McDonnell and Russell, 1999). The investigations of the efficiency of potassium permanganate for control of A. hydrophila infec-tions are few. In vitro investigations on the sensi-tivity of A. hydrophila to potassium permanga-nate are necessary prior to evaluate its efficacy in fish (Schrader et al., 2013). According to McDonnell and Russell (1999) glutaraldehyde is an important dialdehyde used for disinfection. It possesses a broad spectrum of activity against bacteria and their spores, fungi and viruses. For-maldehyde is a highly reactive chemical interact-ing with proteins, DNA and RNA (McDonnell and Russell, 1999), and benzalkonium chloride is a broad-spectrum disinfectant used in aquaculture (Tonguthai, 2000). Gottardi (1991) affirms that iodine exhibits a rapid bactericidal, fungicidal, tuberculocidal, virucidal and sporicidal effect. It penetrates rapidly in microbes and attacks key groups of proteins. Quaternary ammonium com-pounds are irreversibly bound to phospholipids and proteins of cell membranes, thus reducing their permeability (Maris, 1995). The aim of the present study was to determine the sensitivity of Aeromonas hydrophila to disin-fectants and to propose an efficient method for control of fish diseases caused by this pathogen. To this end, the sensitivity of two Aeromonas hy-drophila strains to six disinfectants at various concentrations was tested. Disinfectants, tested concentrations and exposure times used in this research are pre-sented in Table 1. Working solutions are pre-pared ex tempore in sterile distilled water. Table 1: Disinfectants tested in the study. One reference (ATCC 7965) and one clin-ical A. hydrophila strain were used. The ref-erence strain was purchased by the National Bank for Industrial Microorganisms and Cell Cultures, Sofia, Bulgaria. The clinical isolate originated from a silver carp with haemor-rhagic septicaemia and was kindly provided by National Reference Laboratory on Fish, Mulluscs and Crustacean Diseases, Sofia, Bulgaria. They were stored in a freezer and inoculated on soybean casein digest broth (Merck, Germany) prior to the experiment at 28°? for 24 h. Then the strains were inocu-lated on soybean casein digest agar (Merck, Germany) and incubated at 28°С overnight. Bacterial suspensions with density log10 8.32 cfu/mL for both the reference and the clinical strains were then prepared. The sensitivity of experimental A. hy-drophila strains to disinfectants was deter-mined as per Mainous et al. (2011). One hundred μl of bacterial suspension were pi-petted in sterile Eppendorf tubes. To each tube were added either 0.9 mL sterile phos-phate-buffered saline with pH 7.2 (control) or working solutions of tested disinfectants. Af-ter exposure time was over, 100 μL of each bacterial suspension + disinfectant mixture were transferred in tubes containing 9.9 mL sterile phosphate-buffered saline (pH 7.2) and inverted for inactivation of the respective disinfectant. Tenfold dilutions and inocula-tions on GSP agar (Merck, Germany) were then performed. Petri dishes were incubated in a thermostat at 28°С for 24 hours and col-onies were counted. The control sample was run after 6 hours, corresponding to the long-est time of exposure to one of tested disin-fectants. The experiment was conducted at room temperature (22°c). The log reduction measure of efficacy was calculated as per Eryilmaz and Akin (2007) as followed: log10 reduction = log10 pre-disinfection count – log10 disinfection count. A log reduction val-ue of 5 or higher was accepted as indicating a satisfactory bactericidal activity. The results for the sensitivity of experimental A. hydrophila strains to tested disinfectants are presented in Table 2 and Table 3. 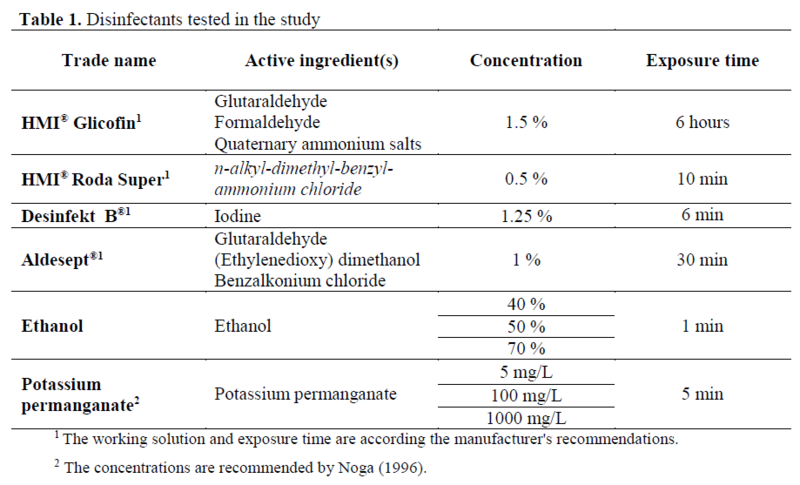 Table 2 shows that the combination glutaraldehyde, formalde-hyde and quaternary ammonium salts (HMI® Glicofin) and glutaraldehyde, (ethylenedioxy) dimethanol and benzalkonium chloride (Aldesept®) inactivated completely (100%, log10 8.32) A. hydrophila (ATCC 7965). Iodine (Desin-fekt В®), n-alkyl-dimethyl-benzyl ammonium chloride (HMI® Roda Super), ethanol (40%, 50% and 70%) and potassium permanganate (1000 mg/L) were also effective against A. hydrophila (ATCC 7965) achieving a complete inactivation (100%, log10 8.32). At a concentration of 5 mg/L, potassium permanganate reduced A. hydrophila (АTCC 7965) bacterial counts by 3% (log10 0.25), whereas at 100 mg/L, inactivated com-pletely the reference strain (100%, log10 8.32). The clinical A. hydrophila strain was also sen-sitive to tested disinfectants (Table 3). HMI® Gli-cofin, Aldesept®, Desinfekt В®, HMI® Roda Su-per, ethanol (40%, 50% and 70%) and potassium permanganate (1000 mg/L) were 100% effective against the strain and inactivated it completely (100%, log10 8.32). Five mg/L potassium per-manganate reduced the counts of the clinical A. hydrophila isolate by 0.7% (log10 0.06), and at concentration of 100 mg/L – by 2.3% (log10 0.19). The control sample exhibited a reduction by 0.8% (log10 0.07). Aquaculture species are extensively developing and thus, diseases in them are among the most significant challenges. Motile aeromonads are considered as important etiological agents of fish diseases (John and Hatha, 2013). A. hydrophila caused diseases are among the most devastating in freshwater fish species, manifested with acute or chronic signs and high death rates. Medicated feeds and water treatment are necessary for control of diseases caused by motile aeromonads (Schrader et al., 2013). We have studies the efficacy of several disin-fectants available as commercial products at con-centrations and exposure times recommended by the manufacturers. They contained one or several active ingredients as glutaraldehyde, formalde-hyde and quaternary ammonium salts (HMI® Glicofin), n-alkyl-dimethyl-benzyl-ammonium chloride (HMI® Roda Super), iodine (Desinfekt В®), glutaraldehyde, (ethylenedioxy) dimethanol and benzalkonium chloride (Aldesept®). Goni-Urriza et al. (2000) have tested the sensitivity of 12 А. hydrophila, 22 A. sobria and 104 A. caviae strains to glutaraldehyde. Most strains were de-stroyed at 0.02%. For 6 of tested strains, includ-ing 4 А. hydrophila, the minimum bactericidal concentrations range was from 0.04% to 0.16% glutaraldehyde. Esteban et al. (1999) demonstrat-ed that 2% glutaraldehyde was effective against А. hydrophila. Similar results were reported by Мainous et al. (2011). In their study, А. hy-drophila was found to be sensitive to 2% glutar-aldehyde solution after 1 min exposure. Palumbo and Buchanan (1988) observed that А. hydrophila was sensitive to 1-min exposure to 0.125% glu-taraldehyde at 25°c. According to Tonguthai (2000) formaldehyde could be used for disinfec-tion at concentrations of 0.001-0.0015%, and for disinfection of hatcheries –0.02% are recom-mended. Benzalkonium chloride exhibits bacteri-cidal and fungicide effects at concentrations be-tween 0.0001% and 0.000125% or as baths at concentration of 0.02% for 30 min. The combina-tions of glutaraldehyde, formaldehyde and qua-ternary ammonium salts (1.5% solution of HMI® Glicofin) and glutaraldehyde, (ethylenedioxy) dimethanol and benzalkonium chloride (1% solu-tion of Aldesept®) destroyed completely the ex-perimental А. hydrophila strains. Potassium permanganate is a strong oxidiser with a marked oxidation effect through the MnO4- ions. During organic matter oxidation (bacteria or fish tissues), MnO4- ions are reduced to MnO2, which is relatively no-toxic, insoluble and biologically unavailable (Lasier et al., 2000). In our study, 5 mg/L potassium permanganate was found ineffective against the tested A. hy-drophila strains. Schraderet et al. (2013) estab-lished a minimum inhibitory concentration of po-tassium permanganate of 158 mg/l. According to our results, the reference A. hydrophila (АТСС 7965) strain was destroyed by 100 mg/L potassi-um permanganate. On the opposite, for the clini-cal A. hydrophila isolate, potassium permanga-nate at 100 mg/L was not effective and only re-duced the bacterial counts by 2.3%. Both tested strains were destroyed by potassium permanga-nate at a concentration of 1000 mg/L. Other re-searchers having investigated the antibacterial effect of potassium permanganate against Aer-omonas spp. Alam et al. (2011) have reported that concentrations of 15, 20 and 30 mg/L had no effect against the microbial agent. Mainous et al. (2011) reported that 30%, 50% and 70% ethanol destroyed A. hydrophila for 1 min. Our results were similar, as both tested A. hydrophila strains were killed by ethanol at 40%, 50% and 70% after a minute. Tonguthai (2000) outlined that iodine was commonly used for disinfection of hatcheries and pools at a dose of 0.0001-0.0005%. Palumbo and Buchanan (1988) observed that 0.001% iodoform inactivated А. hydrophila for 10 min at 25°c. In our experiments, we have also confirmed the bac-tericidal effect of iodine against А. hydrophila, by establishing that 1.25% Desinfekt В® inactivated the tested strains for 6 minutes. Quaternary ammonium salts had a bactericidal effect against А. hydrophila at a concentration of 0.008% after 1 min exposure at 25°c (Palumbo and Buchanan, 1988). In the present study, n-alkyl-dimethyl-benzyl-ammonium chloride (0.5% solution of HMI® Roda Super) was also found to have a bactericidal effect against the tested А. hy-drophila strains after 10-min exposure.In aquaculture, disinfection is used for control of common diseases. It could be a part of routine practice in programmes for biocontrol and pre-vention of specific diseases. On the other hand, it is used as a routine sanitary measure for reduc-tion of morbidity rates or stamping out at farms. The main principles of disinfection in aquacul-ture farming include treatment at concentrations and exposure times, sufficient to kill all patho-gens. The toxicity of disinfectants is the cause for the ban on their use in open water farming; disni-fection is eligible only in hatcheries and storage tanks (OIE, 2010). In aquaculture, disinfection is used for control of common diseases. It could be a part of routine practice in programmes for biocontrol and pre-vention of specific diseases. On the other hand, it is used as a routine sanitary measure for reduc-tion of morbidity rates or stamping out at farms. The main principles of disinfection in aquacul-ture farming include treatment at concentrations and exposure times, sufficient to kill all patho-gens. The toxicity of disinfectants is the cause for the ban on their use in open water farming; disni-fection is eligible only in hatcheries and storage tanks (OIE, 2010). The combinations of glutaraldehyde, formal-dehyde and quaternary ammonium salts (HMI® Glicofin) and glutaraldehyde, (ethylenedioxy) dimethanol and benzalkonium chloride (Aldesept®) were effective against A. hydrophila. Iodine (Desinfekt B®), n-alkyl-dimethyl-benzyl-ammonium chloride (HMI® Roda Super), ethanol (40%, 50% and 70%) and potassium permanga-nate (1000 mg/L) were also found effective against A. hydrophila. At concentration of 5 mg/L, potassium permanganate was not effective in destroying A. hydrophila (АTCC 7965), whereas at 100 mg/L, inactivated completely the reference strain. At concentrations of 5 mg/L and 100 mg/L, potassium permanganate was not ef-fective against the tested A. hydrophila isolate. The results from the present study could be use-ful for aquaculture farmers with respect to control A. hydrophila diseases in fish. Alam, M., Rahman, M.M., Foysal, M.J., Hossain, M.N., (2011). 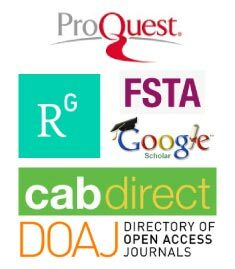 Determination of lethal con-centration and antibacterial activity of com-monly used disinfectants, International Journal of Natural Sciences, 1(4): 102-105. Aoki, T., (1999). Motile Aeromonads (Aer-omonashydrophila). In: Woo, P.T.K., Bru-no, D.W. (Eds. ), Fish diseases and disorders, Volume 3: Viral, Bacterial and Fungal Infec-tions, CABI Publishing, London, 427-453. Cipriano, R.C., Bullock, G.L., Pyle, S.W., (1984). Aeromonashydrophila and motile aeromonad septicemias of fish. US Fish and Wildlife Publications, Paper 134. Eryilmaz, M., Akin, A., (2007). Comparison of efficacy of some hand antiseptics against meticilline-resistant Staphylococcus aureus, TürkMikrobiyolojiCemiyetiDergisi, 37(3), 161-163. Gottardi, W., (1991). Iodine and iodine com-pounds. In: Block, S. (Ed. ), Disinfection, sterilization, and preservation, 4th edn, Phil-adelphia, 152-166. Ibrahem, M.D., Mostafa, M.M., Arab, R.M.H., Rezk, M.A., (2008). Prevalence of Aer-omonashydrophila infection in wild and cultured tilapia nilotica (O. niloticus) in Egypt. In: Eighth International Symposium on Tilapia in Aquaculture. Proceedings. Cai-ro, Egypt, 1257-1271. ICMSF (International Commission on Microbio-logical Specifications for Foods), (1996). Microorganisms in foods 5. Microbiological specifications in food pathogens, BlackieAcademic and Professional, London, 524 pages. John, N., Hatha, A.A., (2013). Distribution, Ex-tracellular Virulence Factors and Drug Re-sistance of Motile Aeromonads in Fresh Wa-ter Ornamental Fishes and Associated Car-riage Water, International Journal of Aqua-culture, 3(17): 92-100. Maris, P., (1995). Modes of action of disinfect-ants, Scientific and Technical Review, 14(1): 47-55. McDonnell, G., Russell, A., (1999). Antiseptics and Disinfectants: Activity, Action, and Re-sistance, Clinical Microbiology Reviews, 12(1): 147-179. Noga, E., (1996). Fish disease: Diagnosis and Treatment. Blackwell Publishing Company, Iowa. ISBN 978-0-8138-2558-8, 367 pages. OIE, (2010). Methods for disinfection of aqua-culture establishments. In: Manual of Diag-nostic Tests for Aquatic Animals. http://web.oie.int/eng/normes/fmanual/1.1.3_DISINFECTION.pdf. Parker, J., Shaw, J., (2011). Aeromonas spp. clin-ical microbiology and disease, Journal of In-fection, 62(2): 109-118. Tonguthai, K., (2000). The use of chemicals in aquaculture in Thailand. In: Arthur, J.R., Lavilla-Pitogo, C.R., Subasinghe, R.P. (Eds. ), Use of Chemicals in Aquaculture in Asia. Proceedings of the Meeting on the Use of Chemicals in Aquaculture in Asia, Philip-pines, ISBN 9718511490. p. 207-220.